Apologies for the sugar rush this week, but ’tis the season. There’s a sweet little pie shop in my neighborhood that boasts a bakery case full of the cutest little pies you’ll ever see. Pies in jars, lollipop pies, handheld pies. Little deep-dish pies piled impossibly high with whipped cream or meringue. Itty-bitty mini muffin bite-sized pies. And, of course, the classic larger size. I love them all, but my special favorite is the Cutie Pie, made in a standard-size muffin tin. It’s substantial enough, but you can get away with eating one all by yourself. In fact, I recommend that you do so. Make them for your holiday table, sure, but be sure to set aside a few moments and at least one tiny pie to enjoy alone as well. This entry was posted in Baking, Desserts, DIY, Food, Recipes and tagged apple pie, apples, dessert, fruit recipes, individual pie, mini pie, pie, Thanksgiving recipe on November 13, 2012 by emmycooks. I have a book in which I record, from time to time, the big and small adventures in our family’s life. I mean to write in it every day, just a sentence or two. More often, weeks or even months go by between entries. I try to catch the important stuff, though, when I do sit down to write–milestones and anecdotes from our daughters’ lives, travels we want to remember, loving moments with our extended family. And, of course, what’s happening in the kitchen. Our family’s book begins with applesauce. 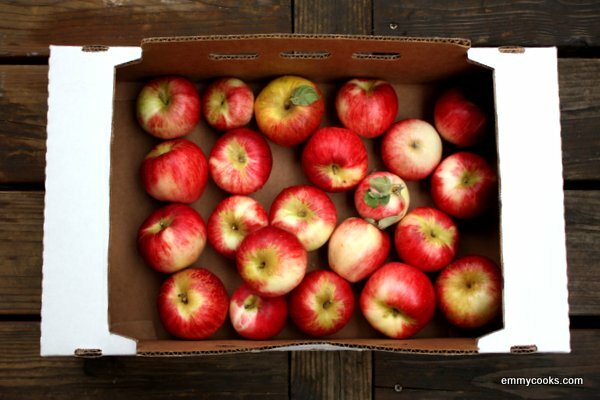 It was an October when I started the family journal (abandoning, in the process, my girls’ individual baby books) and we had just turned our three trees worth of apples into a year’s worth of applesauce. 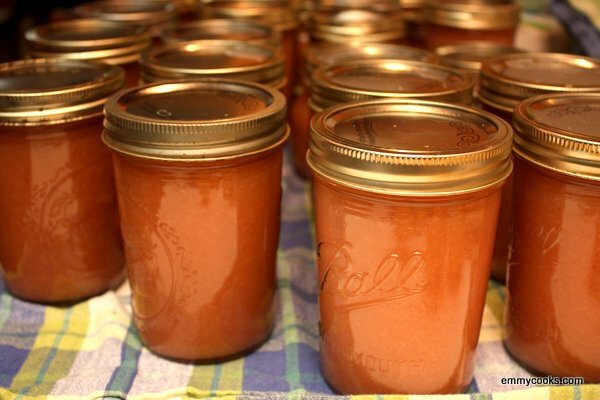 So in a way, I think of making applesauce as the beginning of each new year. At this time of year I often flip back through the years contained in my book and marvel at how fast life changes. And how each chapter is even better than the last. This entry was posted in Breakfast, DIY, Easily Multiplies to Feed a Crowd, Feeding Kids, Food, Preserving, Recipes, Sauces, Snacks and Apps, Vegan or Would-Be-Just-As-Good-Vegan and tagged apple sauce, apples, applesauce, baby food, DIY, fall recipes, fruit recipes, preserving on October 20, 2012 by emmycooks. The ways of the fruit trees are mysterious to me. One year it’s a bumper crop of plums, this year just enough for one indulgent afternoon. The apple trees are staggering under the weight of their fruit, but we only got one apricot. And the pear tree, espaliered out of the way on our small city lot, produced its customary dozen pears. Which yielded, after a little bit of cleanup and a lot of simmering down, one and a half cups of chunky pear sauce. 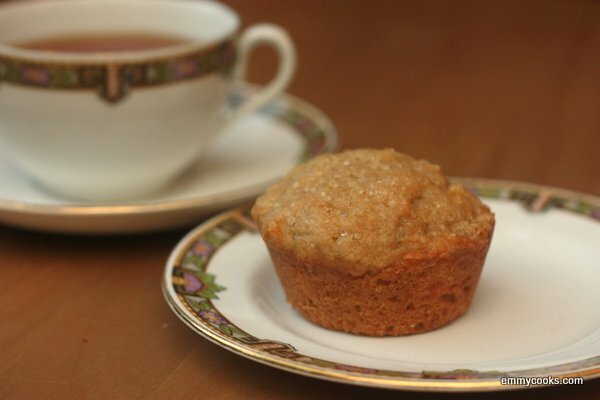 We made the most of it with these muffins. This entry was posted in Baking, Breakfast, Cakes, Desserts, Emmy Cooks Original, Food, Fruit, Recipes and tagged backyard fruit, breakfast or dessert, fruit recipes, muffins, muffins-that-are-really-cupcakes, pears on September 24, 2012 by emmycooks. It’s not easy getting through a watermelon that weighs more than a small child. But honestly, it’s not that hard, either. 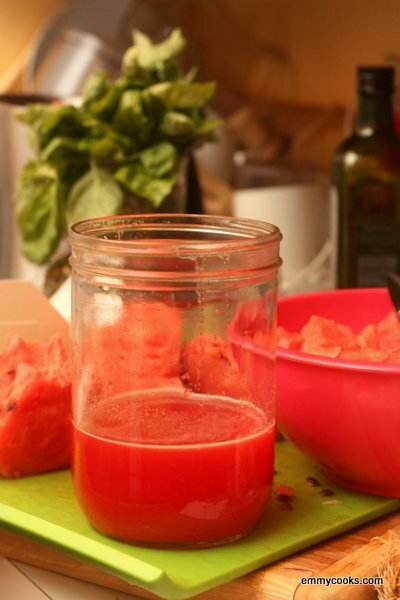 This entry was posted in Beverages, Fruit, Recipes and tagged cocktail recipes, fruit recipes, summer recipes, watermelon, watermelon juice on September 16, 2012 by emmycooks.